ROOMS – istaran budget hotel have variety of rooms from standard, cabin, and dorm-type rooms. All rooms are airconditioned with individual toilet and bath, shower heater, bidet and stainless bar hanger for wet clothings. All are equipped/installed with flat TV, cable connection, wall fan, cabinet, side and coffee table. Soon this 2012, all rooms will be installed with intercom and the entire hotel will be equipped with CCTV. The entire municipaliy of Caramoan has no telephone service. Some Bikol signages prominently placed elsewhere in the hotel are: “Baye” for female. “Lake” for male. “Ponsyonan” for place of activity. “Paluwas” and “Palaog” for exit and entrance. “Maogmang Pag-abot” for welcome. Menu sheet where you can find pinakiri-kiti (sizzling); kusido (sinigang); linabonan (steamed or boiled); TapBadSiGoc – tapa, badi, sinanlag, sogoc (daing, sinangag at itlog), tasigoc, longsigoc, etc; Kinonot – ginataang pating (shark meat in coconut milk); Bicol express (a bikol delicacy of hot chili with small amount of pork meat in coconut milk); Tinoktok – pinangat (a freshwater shrimp or crab (talangka) finely chopped wrapped in several layers of gabi leaves in coconut milk); Seaweeds atsara special; and, many other locally made dishes and kakanin. istaran budget hotel promises a breathrough in tourism related facilities.Despite frequent brown-out in the place, it is a brown-out free hotel and wi-fi ready all the time. It’s committed to provide special activities in its airconditioned function hall such as movie shows, live performances, Pay Per Views, eat-all-you-can, public ballroom dancing, seminars and training workshops. istaran budget hotel is designed by Architect Virgilio Montero of Nabua, Camarines Sur as commissioned by owner spouses Angel Naval and Jennifer Cordial Naval, CPA (DBP Accountant), the daughter of Carlos (Kape Caloy) and Virginia (MayVinYing) Cordial. Jennifer takes charge of the financial operations while Angel, a Provincial Board Member of Camarines Sur, takes charge of the construction and general operations of the hotel and its related services. istaran budget hotel is staffed by competent personnel. They are graduates of Hotel and Restaurant Management (NCII passers), Food Technology, Information Technology, Education and Automotive Mechanic. Others are experienced electrician, carpenter, welder, plumber, painter, dedicated housecleaner and houseguards. 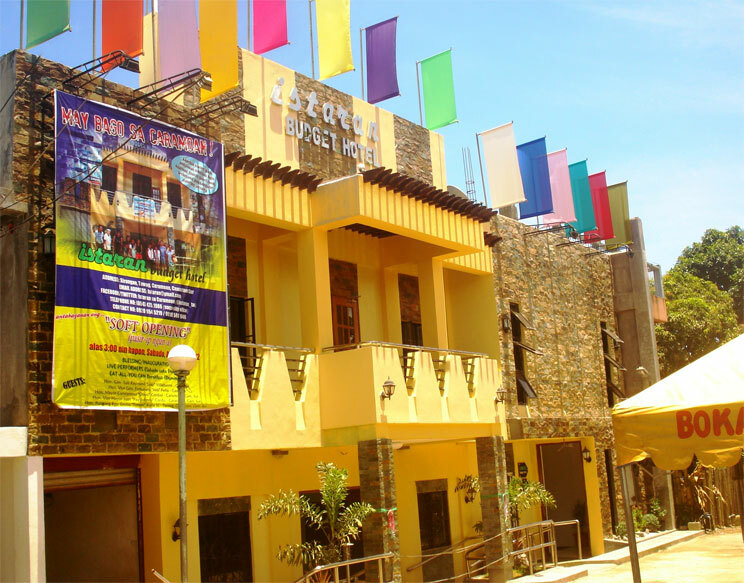 istaran budget hotel is a two-storey building where the function hall and coffee shop, administrative office and frontdesk are all located at the ground floor. At the second floor are 12 rooms, receiving lobby with 4 sofa sets, various indoor games facilities, prayer area and spacious hallway in-between rooms. Wellness area (mini gym) can be found at the rooftop. A fireman’s pole is intalled from the rooftop to ground floor to add enjoyment to kids sliding down from the rooftop without taking the stairs but kidding aside, it serves as the emergency exit to those at the rooftop. The hotel is compliant of fire safety and emergency facilities. The function hall has 5 big doors, Second floor has 3 exit stairs with fireman’s slidepole. The rooftop has 1 stairs plus the fireman’s slide pole. Exit diagrams are placed in every room and elsewhere in the building. CCTV and smoke detector gadgets are strategically installed in the whole hotel building.